FERPA defines “directory information” as information contained in the education records of a student that would not generally be considered harmful or an invasion of privacy if disclosed. 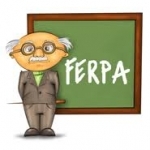 FERPA requires each institution to define its directory items. FERPA permits public disclosure of directory information without the student’s consent unless the student has requested that directory information be withheld. A student’s directory information may be released to an inquirer, outside the school, unless the student specifically requests that directory information be withheld. However, FERPA does not require that directory information be released—it is at the discretion of the institution. It is IOHS practice not to provide mailing lists to third parties. Any information not specifically listed as directory information is considered non-directory information. When is Directory Information Not Really Directory Information? It is important to also understand the concept of “implicit disclosure.” An implicit disclosure may occur when a list consists only of directory information but the list itself by definition reveals non-directory information. For example, a list of names and email addresses of all students who have a particular grade-point average reveals the students’ GPAs. Likewise, a class list containing names and email addresses of the students reveals class enrollments. Since neither grade-point average nor class enrollment are directory items, releasing these lists without prior consent of the students constitutes a FERPA violation. How Does a Student Request that Directory Information be Withheld? The student must complete and sign the Request to Withhold Directory Information form to keep directory information confidential. At IOHS , we call this “requesting confidentiality” and we mark the student’s record as “Confidential.” The signed form must be taken in person, or mailed along with a copy of photo identification, to any the Registrar’s office. If an email address is provided, notification will be provided to the student when the directory hold is in effect. Student name/address is excluded from future printed telephone directories and other similar printed material, such as commencement programs. Requests filed within ten days after the start of registration for fall semester will prevent public information from appearing in printed directories and other annual publications. Requests filed after the first ten days of the fall semester shall be effective only with respect to the inclusion in printed materials prepared after the receipt of the request. Student name and address will be removed from the IOHS online Web directory. Enrollment and degree awarded inquiries from third parties, including potential employers and insurance companies, will neither receive a confirmation of enrollment nor graduation. No Information will be released to any person(s) on the telephone or via email. Address changes must be made by the student only, notifying Registrar’s office, or by mailing a written request along with a copy of photo identification to the Registrar’s office. It is important to note that a student’s request for confidentiality does not permit the student to be anonymous in the classroom (including an online “classroom”) nor to impede or be excluded from classroom communication. How Does a Student Remove A Request to Withhold Directory Information? A request to withhold directory information is in effect permanently, even if the student is no longer enrolled at IOHS, and can only be removed by the student in writing. The student must complete and sign the Request to Release Directory Information form. The signed form may be taken in person, or mailed along with a copy of photo identification, to any campus Registrar’s office. If an email address is provided, notification will be provided to the student when the directory hold is released. Copyright © 2018 Institute of Health Sciences. All Rights Reserved.